San Bernardino couple who opened fire at a holiday party. The FBI is trying to figure out what the San Bernardino couple did in the 18 months after killing 14 people at a holiday party. The Boston Herald reports that the FBI is seeking the public’s help in filling in the gap, which could be critical to understanding whether the couple was in contact with anyone else after the massacre. 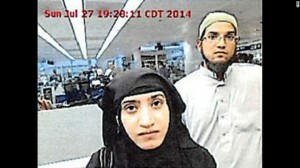 So far, the FBI has found no evidence that the husband-and-wife terrorist team intended to strike another target. Federal investigators also want to now whether Syed Rizwan Farook, 28, and Tashfeen Malik, 29, contacted anyone or stopped anywhere between the attack and the police pursuit. Posted: 1/6/16 at 8:39 AM under News Story.